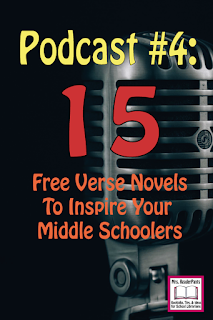 Podcast Episode 4 is all about novels in verse for middle schoolers. Just this school year, we added a Free Verse genre section to our genrefied library. This section isn't very big (yet--I'm waiting on a huge Follett order! ), but it's already been quite popular, especially with our sixth and seventh grade girls. Novels in verse have many advantages, particularly for readers intimidated by lengthier novels. 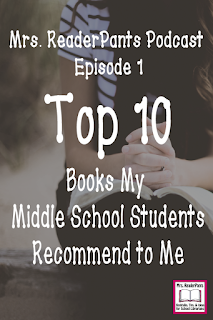 Of course, many of the titles I discuss in the podcast will also work for high school. 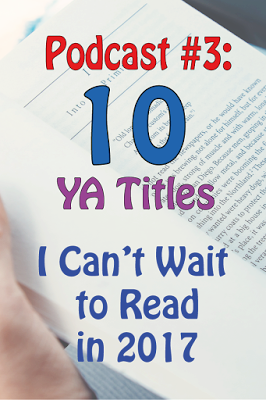 In this episode I share 15 free verse novels and authors, including some that will debut in early 2017. I also included a printable list of 100 free verse novels for middle and high school in the post. Are free verse novels popular in your library? What are your students' favorite titles? Isn't it funny how our students will like the things that we like? I'm not a fan of novels in verse (except Helen Frost's work, which is awesome), so they are a tough, tough sell here. The only one to gain any traction has been, of course, The Crossover. Great podcast, although I have such trouble listening to things. I am much better at reading. Just like our students, we all have our different ways of learning. I gave up on my podcast last year-- it took so much work, and about three people listened! 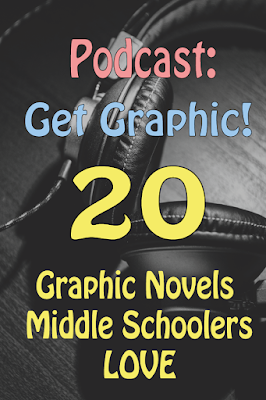 Ms. Yingling--I would have listened to your podcasts! I recommend your site often to other librarians. I love how straightforward your Strengths and Weaknesses reviews are and your honesty. And seriously, how do you read so many books?! Leigh! Thank you SO much. I'm a middle school librarian in Mississauga, Ontario. My students are just starting to discover free verse, so this podcast couldn't have come at a better time. Many of the titles I'd never heard of and I'm excited to track them down. Thank you for sharing your lists! I wrote a grant last year and was able to develop a Verse Novel section for our fiction area. The kids love it, particularly the girls! Thank you for sharing your lists and ideas! Thanks, Debbie and moquinnqwims! Your comments really help keep me going when this podcasting thing feels overwhelming (which is pretty much always)! I am so glad people are finding them useful!